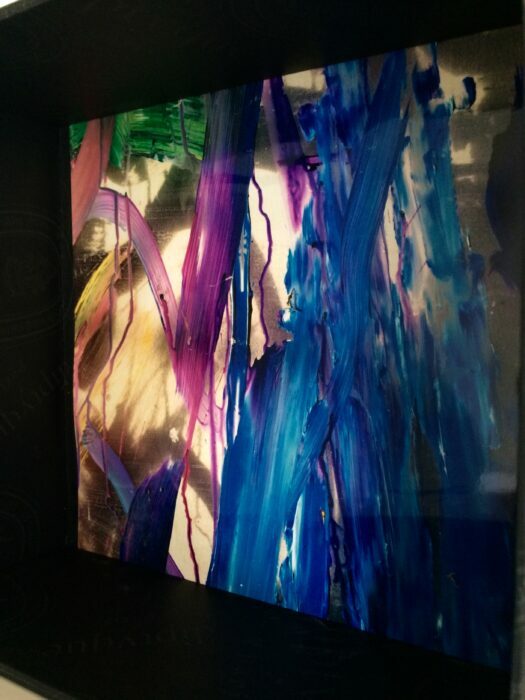 Home > Colour & Music > The Capturing of Gestures, Image and Light. 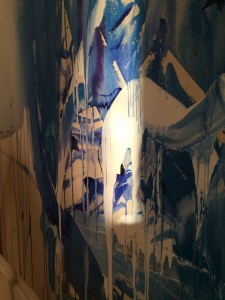 Just the other week I went to see a new show of Fiona Rae’s work at the Timothy Taylor gallery. Her gestural work to me always appears very deliberate and frozen in time and a bit dated, however, the new work is monochrome and exciting in its ability to appear to move quixotically and there is something mesmerising about it. Later that evening I went to see the incredible electronica musician,producer and artist Flying Lotus . Prior to him coming on stage at the large Brixton Academy stage my friend and I pondered on a large canvas box standing empty centre stage. All was soon revealed when he appeared on stage wearing a cap with reflectors and disappeared behind the screen which then became a virtual space with a light show projected onto it. The Bass throbbed, and my whole body felt completely immersed in a very heightened physical and visual way. I had a similar experience late last year when I went to see the incredible (and what felt like a game changing) Ryan Trecartin/Lizzie Fitch show at the Zabludowicz Collection. Here I put on headphones and was completely immersed and bombarded in a cross sensory installation and virtual world experience. 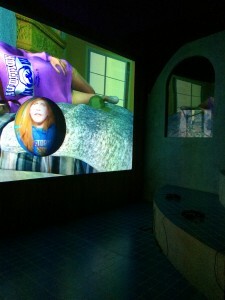 Amazing Installation by Ryan Trecartin and Lizzie Fitch. It was incredible. It reminded me of some of John Zorn’s music, in particular The Big Gundown and his amazing compositions of the eighties, which bombard you from all angles at an amazing speed. When driving back through the night following the Flying Lotus gig, I caught a great show on the radio with the great minimalist composer Philip Glass who has worked extensively in Opera and interestingly talked about importance of how the visual should leave space for music and leave space for the imagination or else he felt it was trying to advertise something. I found this very interesting as it is a world of advertising both overt and subliminal that we live in. There is indeed little room for space and contemplation, and perhaps this is what is being reflected in these artist’s work. There is also a fascinating show on at the moment of John Stezeaker’s work which also contain super fast images which cleverly become contemplative also. Paint and light and their interrelationship as a medium, and the mark’s relevance in capturing time is something that fascinates me and is driving my ongoing work at the moment.